Strudwick Interiors is a kitchen and fitted wardrobe company driven by our passion for crafting items that means something to us and stands out from the rest in both quality and design. We aim to carry out every project with distinction and elegance. Whether you are a private client or developer, an architect, designer or contractor, we can help you achieve the perfection you seek. Every aspect of the project is customised to the client, from initial briefing to design, planning, project management and delivery. All projects of any size and style, from a brand new bespoke kitchen to the smallest furniture job, are carried out with meticulous attention to detail. Prior to accepting a job, we at Strudwick are extremely happy to discuss with every potential client their requirements in detail, in order to find the most suited solution. Established 20 years ago, Jon at Jonathan Reeves Joinery provides joinery for your whole home. Working around your space, style and budget he will create a unique design that fits perfectly in your house. From contemporary kitchen fit outs to luxury handmade walk-in wardrobes to fitted furniture, Jonathan Reeves Joinery are experts in design and installation. They are renowned for their great customer service and attention to detail. By understanding your needs, following an initial consultation, Jon will work with you from idea to implementation. Providing you with a unique solution that you will love to return home to! Get in touch and lets discuss your ideas! Jonathan Silva and his team provide a professional design and manufacture service, working in close collaboration with designers and private clients to handmake bespoke fitted and freestanding furniture. Based in Buckinghamshire, our team has over 20 years experience working primarily with timber to provide contemporary stylings with a classic touch. Our projects often incorporate glass, metal, composites, fabrics and stone, working with outside crafts and trades where appropriate. From your initial contact, we will usually arrange for an informal visit to your home or site to discuss your requirements, talk through ideas and to take measurements. We work closely with all of our clients from initial design process through to the project completion. Call us today! Established by Alex Langstaff-Ellis and Edward Birks in 2009, our success today reflects the company’s style, described as quintessentially English with a contemporary interpretation to detail. Our team of expert cabinet makers design and build everything by hand at our extensive workshops in Oxfordshire. Each commission is made to the highest British standard using the finest sustainable materials and made to last a lifetime. We work with clients on individual commissions such as dressers and bookcases, stunning contemporary and modern kitchens and specialise in full-house projects where we design and create every living space in the home. We are first and foremost, professionally trained carpenters and joiners, with a passion for design and an eye for detail. We are guided by each client’s individual requirements and lifestyles, understanding and interpreting them and successfully delivering the ideal outcome. Our project management style is exemplary, hands-on and enthusiastic. We create bespoke handmade furniture for luxury kitchens, innovative pantries, elegant boot rooms and sublime bedrooms. Our designs are completely individual for each customer, tailored to the architecture of your home and your lifestyle. Our meticulous attention to detail in design and quality characterizes our ethos and is what sets our furniture apart. Please contact us to arrange a visit from one of our designers or visit our beautiful Showroom. We look forward to welcoming you. 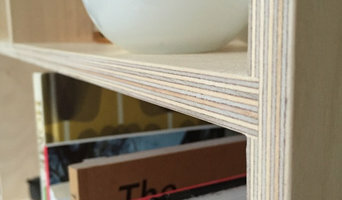 At Brandler-London, we design and build bespoke, fitted furniture specialising in the use of reclaimed wood with a focus on quality, design, and functionality. Whether it’s a wardrobe, a kitchen, an indoor treehouse, an entire block redevelopment, or a flat conversion, our ethos and ambitions remain the same: To design and build visually stunning projects, using raw materials with highly textured finishes resulting in dramatic spaces that are fit for purpose and permeate an earthy warmth and timeless aesthetic. Chris Brandler and his team design, construct, and install all Brandler-London creations themselves, making the process efficient and stress-free for our clients. Our reclamation code, joinery skills, and in-house supplies of rare and rustic reclaimed wood mean we closely control each element of the project, from start to finish. Willow Farm Furniture is a small company that designs and makes bespoke kitchens, wardrobes, studies and other fitted furniture for the home. We work with our clients to produce individual designs to maximise space and help create innovative furniture designs to fulfil their practical and style requirements. Everything is made to order so we are able to produce traditional, industrial or contempary styles of furniture for the whole house and can work with most materials. Finishes range from painted, oiled and varnished We can also provide worktops in a range of materials, solid timbers, quartz, marble and granite. We are a local family business providing excellent customer service to retail and trade clients. We are supplying exclusive superb quality bespoke storage system made in Denmark to highest standards. Each client is treated individually. Our qualified interior designer will listen to your requirements and come up with a truly unique solution for your space. Each design is made to order, nothing is off the shelf. Depending on clients needs we can fully manage your project from delivery to the sign off once the installation is complete . Or we can work on supply only basis. We can supply from one to hundreds of plots projects . We specialise in sliding wardrobes and walk in wardrobes. Our system is also fantastic for pantries, home office, hidden utility, dressers and more . What makes our system different: Beautiful Sliding solid Shaker Style as well as modern doors 22mm panels no 'box' carcases , plinths or filler panels L shape wardrobes Sloping ceiling wardrobes Up to 2.7m h 10% custom made sliding doors and internals. Simply Stunning . 2-4 week delivery If you are after top quality product installed to perfection look no further. What we offer: Fitted bespoke sliding wardrobes. Fitted bedroom furniture Sliding doors Sliding mirrored doors Sliding shaker style doors Storage solutions for: Bedroom, utility room, home office, bathroom storage, bookcase, library, dressing room, walk in, any type of storage furniture can be created. Why should I hire a Twyford, Berkshire cabinet maker? Cabinet makers are skilled craftsmen who can design, make, rework and repair cabinets and cupboards. They can create bespoke storage or kitchen units for your home that meet your needs and fit with your interiors. They can also advise you on materials and cabinetry styles if you’re not completely sure on the design yet. 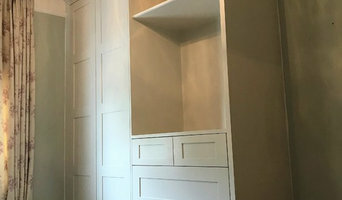 With the right bespoke cabinet makers in Twyford, Berkshire, no cabinetry job is too difficult, so even if you have a tricky corner space that you want to utilise, a Twyford, Berkshire cabinet maker can create a cupboard to your specifications. Bespoke cabinet makers are more than just bathroom or kitchen cabinet manufacturers and they can be commissioned to create storage cabinetry around the home. Bespoke TV cabinets are in popular demand due to the variations of TVs, consoles, digital TV boxes, DVD players and other items that we want to keep near to our televisions. Skilled cabinet makers in Twyford, Berkshire can create a one-of-a-kind TV cabinet or media centre to house all your entertainment goodies. If you already have cabinets or cupboards that you’d like to keep, but they’re just in dire need of a facelift, then bespoke cabinet makers may be able to help, too. You may wish to replace kitchen cabinet doors, give your cupboards a new colour, add decorative elements or use a special finish; whatever the cabinetry task, ask cabinet makers in Twyford, Berkshire if they can help you. If you need the help of a cabinetry professional when renovating a home, make sure they are happy to work with any other professionals working on the project. Here are some related professionals and vendors to complement the work of cabinet makers: Kitchen & Bathroom Designers, Kitchen & Bathroom Fitters, Interior Designers, Home Storage Designers & Professional Organisers, Carpenters & Joiners. How long have you been cabinet makers in Twyford, Berkshire? Find a cabinet maker on Houzz. Narrow your search in the Professionals section of the website to Twyford, Berkshire bespoke cabinet makers and cabinetry. You may also look through Twyford, Berkshire photos to find examples of cabinets that you like, then contact the cabinet makers in Twyford, Berkshire who worked on them.